How to use fieldsets with Lightning? Been trying to figure out how to create a salesforce Lightning input form, based on fields from a fieldset. As an aura enabled apex method is not allowed to pass an entire fieldset I tried by reforming it to a JSON string myself. It kinda works but doesnt feel like I am doing it the right way at all. Anyone can tell what the proper way to display fields from a fieldset in Lightning is ? // Copy the config, note that this type of copy may not work on all browsers! To use it, click on the refresh/reload icon in the upper left. This can take a few seconds as the number of sobjects on a typical org is huge. If you don't have any field sets, you won't see anything in the list. If you do, any object types with field sets are listed. Clicking on the link for the object type will fetch the field sets from the server and display them on the list on the upper right. 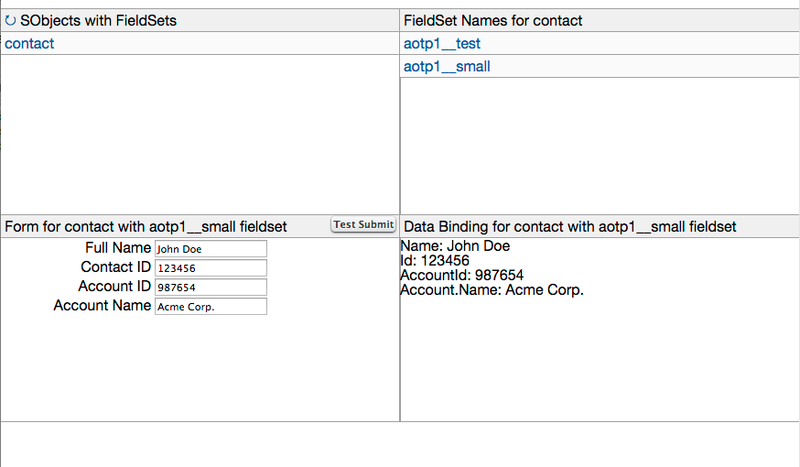 Clicking on a field set link will generate the form and test listing. Enter values and tab out/hit return to see the values change. Click the Test Submit button to see the values. Note that there is a bug in ui:inputDate that can occur when using dynamic creation. You'll get a spinner and be blocked. You can change the DisplayType->component mapping in the configMap in fsTestHelper.js. You could do the mapping otherwise, via code, metadata, etc., if desired. Let me know if you have any questions. It's not a robust app, but it might provide some ideas on how to approach this. Here's a modified version of @Skip Saul's code that works for API version 37. This version allows binding the form field values to the 'record' JS object passed in to the component. As in @Skip Saul's version the form is dynamically created using the fields in the field set. // Have to make a copy of the object to set a new property - thanks LockerService! Let me start with saying thank you for posting this helpful information. It helped me with learning some of Lightning's more advanced features and gave me a jumping off point. Using @bafuda's component as a starting point, here's another field set form variation that lets one save the record back to Salesforce using an upsert. It supports adding a new record and updating an existing record where the fields to display are driven by a specified field set. This was created for my own learning purposes and recommend using other standard components that provide similar functionality first whenever possible such as the force:recordEdit component. For more information, see my Lightning Field Set Form Component Blog Post. // Copy the config so that subsequent types don't overwrite a shared config for each type. Not the answer you're looking for? Browse other questions tagged fieldsets lightning-aura-components or ask your own question. What are FieldSet useful for? How to iterate over SObject list returned in Lightning Component Dynamically? How to use field sets in a lightning component to create a multi-grid structure form with a lightning look and feel? How to get values from dynamically created lightning Components? Is it possible to get an objects fieldsets with the REST API? Is it possible to use FieldSets as Visualforce Component attribute? Can classes be used as types for return values for actions in Lightning Components?